Civic engagement tools empower local residents to take an active role in their communities. Citizens use these platforms to provide authorities with feedback on local services and report infrastructure that needs repair. Governments are now investing in both mobile websites and apps that boost civic engagement. But which of these tools provides them with the best results? How Much Time Do Users Spend on Mobile Websites and Apps? Research shows that mobile apps have higher engagement rates than mobile websites. Digital media users spend 89 percent of their mobile time on apps, compared to 11 percent on the mobile web. Apps are popular with both men and women. Men spent a total of 29 hours and 32 minutes on mobile apps in the fourth quarter of 2013 — up from 22 hours and 27 minutes in the fourth quarter of 2012. Women, on the other hand, spent 30 hours and 58 minutes on mobile apps in the fourth quarter of 2013. This was around seven hours more than during the same period in 2012. Digital users spend 90 percent of their mobile time on apps, according to a separate study. People were more likely to view videos, check utilities, play games and visit social media through an app than a mobile browser. This information on mobile usage is important for elected officials who want to communicate with the local population. While the mobile web is popular, apps are far more effective when it comes to engaging users. Creating a civic engagement app, therefore, could provide authorities with a substantial return on their investment. There were 207.1 million smartphone users in the United States in 2016, and this number is expected to swell to 264.3 million by 2021. Most smartphones have a mobile browser — Chrome is currently the most popular, followed by Safari, Android’s stock browser, Opera Mini and Internet Explorer — which provides users with quick access to the internet. As a result, this technology is great for reaching the local population. Citizens can access government services from their handset and contact elected officials with a swipe of a finger. Mobile apps, however, are much better for loyalty. Once citizens have downloaded and installed a civic engagement app, it will stay on their mobile home screen. This will encourage more people to connect with officials in their area. The average American is predicted to spend 2 hours and 25 minutes per day on mobile apps — an increase of 10.3 percent over last year. Apps are also useful for retention. Using the latest behavioral information, location data and curated content, authorities can customize their app based on the needs of the user — something that will encourage local residents to visit them again in the future. Plus, officials can keep users informed with the latest local developments via push notifications — alerts that pop up on a mobile device. The smartphone screen is valuable real estate for city authorities. More than 50 percent of smartphone users grab their device immediately after waking up, making smartphones a great tool for community engagement throughout the day. Mobile apps provide citizens with a number of benefits. Users can report issues in real time, contact the right government department and track interactions with elected officials. Whether they are reporting a broken water supply or pothole, residents have all the information they need on their mobile device. Unlike mobile websites, apps provide users with offline connectivity. Under these circumstances, citizens can check local services even when they are not connected to the internet. Apps offer more flexibility, too. Users can tap, swipe and pinch their screens to access features — something that’s not always possible on regular mobile websites. Another benefit of apps is speed. Studies show that apps are faster than the mobile web. Plus, apps store users’ preferences more effectively than mobile websites. This way, citizens don’t have to enter the same information every time they engage with local authorities. These are just a few of the reasons why mobile apps are so popular. Users now download an average of 8.8 apps every month, while app installs have increased 5 percent year-on-year. Are Civic Engagement Apps Worth the Investment? Some authorities think that apathy prevents residents from getting involved with their communities. This couldn’t be further from the truth. Research shows that 39 percent of adults carry out political or civic activities on social media while 34 percent contact government representatives online. Moreover, 17 percent of the electorate have signed a petition online. Now, local authorities can motivate residents to perform their civic responsibilities through a mobile app. People are becoming more engaged in community initiatives, spurring city authorities to invest in civic engagement tools. 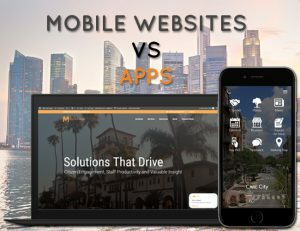 While mobile websites are certainly useful, apps encourage more people to report infrastructure issues and connect with officials. MyCivic Apps is a cloud-based service that optimizes request management and community engagement. Cities can provide local residents with reporting tools and government services in one place.